What names do you want written in the sand? What saying would you like in the sky? Then, in the sky it will have Live Well, Laugh Often, Love Much with computer-generated text :) If you want a different saying or bible verse, just let me know in the comments section when you check out. Let me bring the magic of the beach to you! I am touched and eager to share my passion for nature and the beauty of the beach with you. 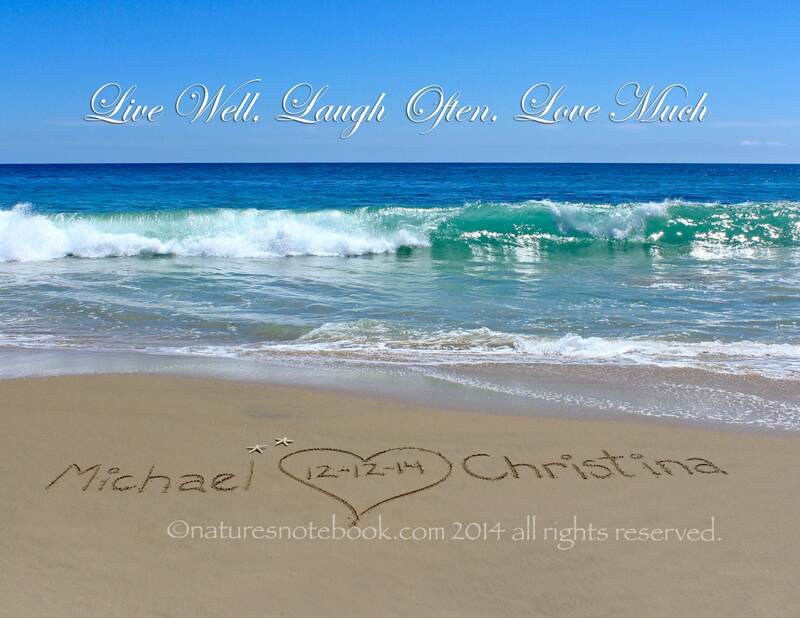 The oceans’ tranquility, pounding surf, and sparkly water makes the perfect backdrop to express love and emotion with your message written in the real beach sand. Something about its tumultuous fate, an uncertainty that parallels our own lives makes the beach sand a perfect tablet for expression. When you see your personalized beach photograph, you will feel like you want jump in your picture as if you were right there, when I wrote your message in the sand. I want to pass along the joy I had in making each photograph a work of art. 1.) 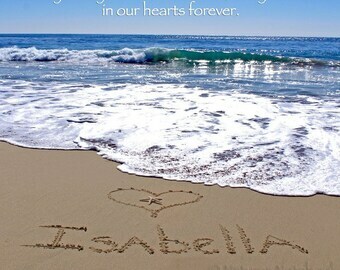 When checking out in the personalized section, please put the names/date/thought you want to be written in the sand. 2.) I will write your names/date/thought in the beach sand. 4.) After you approve your proof, your order will ship right away. 5.) Wahooo, a magical piece of the beach will arrive at your doorstep. - Each piece comes with a seal/certificate of authenticity. - FREE Gift with every Purchase (4x6 Inspirational Photo) I want to share the LOVE. Feel free to pass this photo on as a gift, or hang in your home for years to come. Oh goodie gumdrops, do I love to hear from my customers. Please feel to email with any questions you may have. I am happy to help in any way I can and look forward to helping you create a one of kind gift. Photo was perfect! Arrived on time. Expertly produced. Thanks. Unfortunately wedding was cancelled due to hurricane. Will probably be getting another. Beautifully executed product! Courtney was great - I had a deadline to meet and she exceeded it! Would highly recommend her for quality and service! Thanks again!